"NIU has very impressive candidates. Every year we come here, and every year we hire someone." Our job fairs showcase only technology and engineering students, so you won't waste time sifting through students with the wrong qualifications. 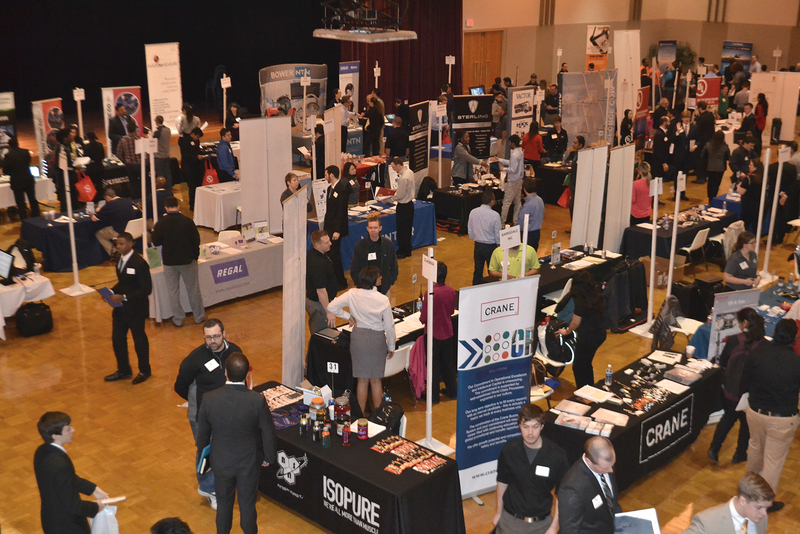 Almost 400 students attended the Fall 2018 Job & Internship Fair. These events are perfect for finding co-ops, internships, and part-time and full-time professionals. Registration is $400. Nonprofit companies can register at a discounted rate of $200. Organizations who register by Jan. 14 will receive a $50 discount. The registration fee is per table, not per company. If you prefer to have two booth spaces at the fair, you must register for each space separately. Registration is limited to 60 companies and closes two weeks before the fair date. If your preferred date is unavailable, email ssamuels@niu.edu to be placed on a waiting list. Companies on the waiting list will be contacted if space becomes available. The fair will be held from 10:30 a.m. until 3 p.m. at the Barsema Alumni and Visitors Center. Recruiter setup occurs from 9:30 until 10:30 a.m. Included in your registration is one table, two chairs, a continental breakfast, lunch for two recruiters and parking for two vehicles. Electricity is available. Additional lunches may be purchased for $15 each and additional parking passes for $5 each; orders must be placed no later than two weeks before the fair. There are dining options located inside the Holmes Student Center. CEET is not responsible for tickets that guests may incur for campus parking violations. If you wish to pay by check, please contact Stephen Samuels. Once registered, you will receive an email confirmation of your registration and detailed information regarding the fair.